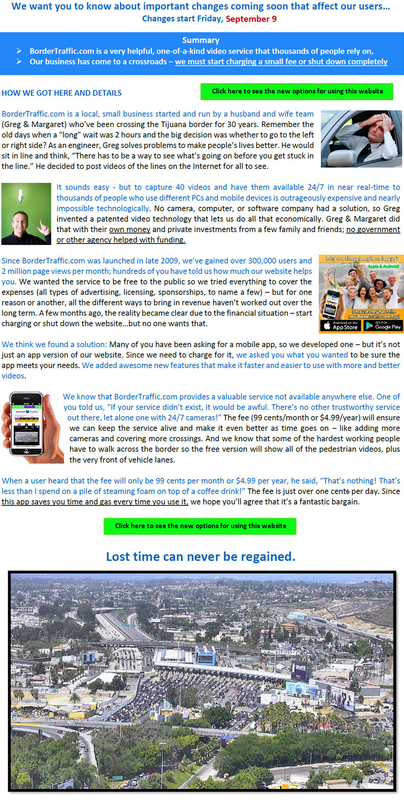 I understand that Solutions XYZ’s service is limited to providing users and members with information (video and text) about motor vehicle traffic conditions and wait times at certain crossings at borders between the USA and Mexico/Canada. I understand that under no circumstances shall Solutions XYZ be liable for any delay or failure in performance resulting directly or indirectly from acts of nature, forces, or causes beyond its reasonable control, including, without limitation, Internet failures, computer equipment failures, telecommunication equipment failures, other equipment failures, electrical power failures, strikes, labor disputes, riots, insurrections, civil disturbances, shortages of labor or materials, fires, floods, storms, explosions, acts of God, war, governmental actions, orders of domestic or foreign courts or tribunals, non-performance of third parties, or loss of or fluctuations in heat, light, or air conditioning. As a VIP Member, I will have access to view available videos and/or text regarding Sentri, Fast, and Nexus lanes at particular border locations. I understand that I will be allowed a maximum of 40 views per day of any “VIP-only” image. A counter will indicate the number of views I have had. VIP video clips will time-out after 15 minutes.